The Church today celebrates the Memorial of St. John Bosco. This poor farm boy turned priest became the founder of the Salesians named for St. Francis deSales. The Salesian order is dedicated to the education of street kids. To date, the Salesian order is the second largest religious order in the world serving in 128 countries. 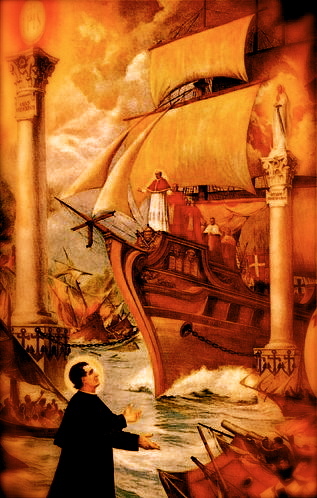 Don Bosco, as he was known by his waifs, was also known for his Words of Knowledge and prophetic dreams. In art, the street kids are always seen in hats or caps to hid their foreheads. Why? Well, because Don Bosco had the gift of reading hearts and he used to tell them he saw their sins written on their foreheads of course! There are several volumes of his dreams, but the following dream is the most famous. Many see a connection between this dream and the Servant of God Pope John Paul II…but we will let you judge. Call on Don Bosco’s intercession if you work with the youth; you may never know what will happen with your dreams. “In the midst of this endless sea, two solid columns, a short distance apart, soar high into the sky. One is surmounted by a statue of the Immaculate Virgin, at whose feet a large inscriptions reads:” ‘Auxilium Christianorum’ (‘Help of Christians’) . The other, far loftier and sturdier, supports a Host of proportionate size, and bears beneath it the inscription: ‘Salus credentium’ (‘Salvation of believers’). “The flagship commander – the Roman Pontiff- standing at the helm, strains every muscle to steer his ship between the two columns, from whose summits hang many anchors and strong hooks linked to chains. The entire enemy fleet closes in to intercept and sink the flagship at all costs. They bombard it with everything they have: books and pamphlets, incendiary bombs, firearms, cannons. The battle rages ever more furious. Beaked prows ram the flagship again and again, but to no avail, as, unscathed and undaunted, it keeps on it course. At times, a formidable ram splinters a gaping hole in its hull, but immediately, a breeze from the two columns instantly seals the gash. “Meanwhile, enemy cannons blow up; firearms and beaks fall to pieces; ships crack up and sink to the bottom. In blind fury, the enemy takes to hand-to-hand combat, cursing and blaspheming. Suddenly the Pope falls, seriously wounded. He is instantly helped up, but struck a second time, dies. A shout of victory rises from the enemy, and wild rejoicing seeps their ships. But no sooner is the Pope dead than another takes his place. The captains of the auxiliary ships elected him so quickly that the news of the Pope’s death coincides with that of his successor’s election. The enemy’s self-assurance wanes. “Breaking through all resistance, the new Pope steers his ship safely between the two columns; first, to the one surmounted by the Host, and then the other, topped by the statue of the Virgin. At this point, something unexpected happens. The enemy ships panic and disperse, colliding with and scuttling each other. “Some auxiliary ships, which had gallantly fought alongside their flagship, are the first to tie up at the two columns. Many others, which had fearfully kept far away from the fight, stand still, cautiously waiting until the wrecked enemy ships vanish under the waves. Then they too head for the two columns, tie up at the swinging hooks and ride safe and tranquil beside their flagship. A great calm now covers the sea. ” (memoirs, Vol. VII. Pages 107-108). Published in the Internet on Saturday, April 20, 2002. U.S.A.